Experience the ancient magnificent temple complex which was once covered by the rainforest after being abandoned and sail on the Mekong river. The Mekong is a lifeline of the people here. This 11-day Cambodia & Vietnam tour package includes visiting several highlight places such as: Angkor Wat, Siem Reap, Apsara Dance in Siem Reap, Angkor Thom, Cu Chi Tunnel, Notre Dam Cathedral in Hanoi, Cyclo tour in Hanoi, Halong Bay cruise, Ho Chi Minh mausoleum among others. . Keep reading for the day-wise tour itinerary, flights, and hotel stay. Contact us to book your tour today. In the afternoon, visit to the unique interior brick sculptures of PrasatKravan, SrahSrang (“The Royal Baths” was once used or ritual bathing), BanteayKdei (surrounded by 4 concentric walls), Ta Prohm, one of the area’s most beautiful temples. Ta Prohm has been relatively untouched since it was discovered and retains much of its mystery. NeakPean, a fountain built in the middle of a pool (representing the paradisiacal Himalayan mountain-lake) and Preah Khan temple, Built by the King Jayavarman VII. Preah Khan is, like Ta Prohm, a place of towered enclosures and shoulder hugging corridors. Unlike Ta Prohm, however, the temple of Preah Khan is in a reasonable state of preservation and ongoing restoration efforts should maintain and even improve this situation. Dinner with Apsara Dance show at Apsara Restaurant Theater. Breakfast at hotel. Visit the antique capital of Angkor Thom (12 century): the South Gate with its huge statues depicting the churning of the ocean of milk, the Bayon Temple, unique for its 54 towers decorated with over 200 smiling faces of Avolokitesvara, the Phimeanakas, the Royal Enclosure, the Elephants Terrace and the Terrace of the Leper King. In the morning, we will enjoy a boat ride on the Tonle Sap Lake at Kampong Phluk Village. This is the largest permanent fresh-water lake in South East Asia and flows into Tonle Sap River, joining the Mekong in Phnom Penh. We will see a fishermen’s “floating village” with floating schools, floating police station, etc. It is same as a big village floating on the lake, and the “village” move from place to place following water levels and current. Transfer to Siem Reap airport for flight to HCMC. Upon arrival at HCMC airport, meets and transfers to hotel for check in. At 6:00PM, our guide pick up you for the street food tour. 8:00am our guide and driver pick up you from the hotel for Cao Dai – Cu Chi Tunnels tour. The Great Holy See Temple, built in 1926, is considered one of the most striking structures in all of South-East Asia. It is the headquarters of the unique Cao Dai sect, a religion with a hybrid of Buddhism, Christianity & Confucianism. Above the entrance is the all-seeing holy eye – symbol of the sect. Visitors will attend the midday ceremony’s extravaganza to witness the daily mass held by the Cao Dai followers which is a fantastic experience. After lunch, proceed to Cu Chi to explore the amazing site where Viet Cong hid during the War. It is now a popular spot for both Vietnamese & foreign tourists – the network of over 200km of tunnels became legendary when they played a vital role in the War. In their heyday, the tunnels were functioning underground cities including numerous trap doors, specially constructed living areas, storage facilities, weapons factories, field hospitals, command centers & kitchens. There is plenty of evidence of the fierce battle that took place here during the 1960s when Cu Chi was a “Free Target Zone”. Visitors can watch a short introductory video showing how the tunnels were constructed before entering the tunnels. Spend the next hour exploring the tunnels. Afterwards, enjoy tea, cassava (guerrilla’s food in war time). Return to SaiGon. 7:30am our guide and driver will pick up you from the hotel and depart for Cai Be. Enjoy the scenic journey along the National Highway bordered by green rice fields. On arrival at Cai Be, you will take a boat trip to discover the beauty of Cai Be floating market where local people sell, buy and exchange goods on their boats. Then stop at a village where you will see local people making rice paper and coconut candy. Enjoying free sample of local specialties and discovering daily activities of local people. Proceed to An Binh island, enjoy Vietnamese traditional music and take a rowing boat trip along small canal in shade of trees. Rest for a while, you will ride bicycle along village road to view countryside, fruit garden…. After lunch at local house, you will visit the local people who produces bricks and potteries. Proceed to Vinh Long city and get back to HCM City. 8:00am, we start the trip by visiting Notre Dame Cathedral, the historic Central Post Office, followed by exploring the Reunification Palace, and the remarkable site of the War Remnants Museum, (optional Ben Thanh Market). Then you will be taken to the airport for the flight to Hanoi.Upon arrival at Hanoi airport, meets and transfers to Halong. Hotel in Halong. After breakfast at hotel, your car will transfer you to the dock to embark a boat tour and start your cruise to discover this famous World Nature Heritage Site. Within 5 hours, we will cruise through the tranquil emerald water, passing thousands of wonderful limestone islands and outcrops in different shapes and sizes emerging unevenly out of the water. 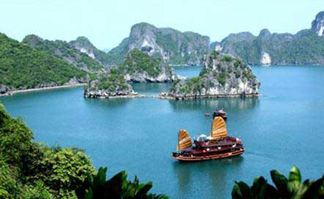 We will also visit Heaven Palace – Driftwood cave, explore one of the most famous grottos of Halong Bay. Lunch with seafood will be served on board while the cruise gliding slowly on the Bay. Back to the dock and get your transfer back to Hanoi. Hotel in Hanoi. You are picked up from your hotel and taken by private car to the Cooking class. The class starts with the market trip. The guide will bring you to Chau Long market and tell you about the main ingredients in Vietnamese cuisine, so you can have a clearer overview about Vietnamese food and an insight into Vietnamese herbs and spices (herbs and spices are important in Asian dishes). After buying the necessary ingredients for the class you choose, you will come back to our class kitchen and listen to the dishes’ principles and general methods. After that you can cook yourself and enjoy your Masterpiece!!! In the afternoon, you will take a cyclo tour around Hanoi Old Quarter. Then visit Hoan Kiem Lake, Ngoc Son Temple before enjoy a water puppet show – a traditional art of Vietnam. You have breakfast at your hotel then our tour guide will take you for a half day city tour. First, we will head to the West lake to visit Tran Quoc pagoda, the Oldest one in Hanoi located in a semi island on the lake, enjoy tranquil atmosphere. Then, we will visit Ho Chi Minh mausoleum and his stilt house to learn about his life attached with the two Vietnamese Wars. Visit the One Pillar Pagoda nearby which was built in early 11th century under the Ly dynasty and is regarded as one of the most iconic temples in Vietnam. Continue to visit Literature Temple, the first university of Vietnam, built in 1070 at the time of King Ly Thanh Tong (Ly dynasty). This ancient site offers a lake of literature, the Well of Heavenly Clarity, turtle steles, pavilions, courtyards and passageways that were once used by royalty. Visiting the Temple of Literature you will discover historic buildings from the Ly and Tran dynasties in a revered place that has seen thousands of doctors’ graduate in what has now become a memorial to education and literature. You get on car to the Noi Bai airport for the flight back. Tour ends. 8 nights twin/double sharing at hotels with daily breakfast. Land transfer by private vehicle for the whole trip. English speaking guides on touring days. Admission fees on touring days. 1 bottle of mineral water per person on touring day.